Is there a Evernote client? Evernote is a cool site for capturing note, tagging it and retrieving it from everywhere. The Web application is nice but I was wondering if anyone knows about a standalone version such as for Windows, Android,... but for Ubuntu ? I believe they dont have linux support but here is a cool article on various alternatives. On Linux, you can use NixNote (previously Nevernote), an unofficial Evernote client written in Java but if you want something lightweight, you should try Everpad, a new Evernote client that integrates nicely with Unity. It supports online sync, notes, tags, notebooks, file attachments (remember there's a 60 MB monthly limit) and places. Once installed all you need to do is search for ‘Everpad’ in the Unity Dash and then run the Everpad application. You will then see the app indicator appear on your panel. Once it does, click on it and select “Settings & Management” then “Authorise” to configure Everpad with your Evernote account. To create a new note, simply click on the Everpad app indicator and select “Create Note” or click on an existing note to edit it. Not really, no. You might consider running the web app in Prism, which is quite a nice bit of kit that allows you to run a web app in a standalone window/browser. Or you can use Wine, which works fairly well with Evernote. 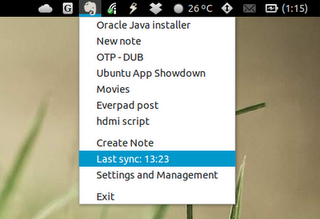 Add Gnome-do and it's extremely useful. I've just installed Evernote app for Android as Chrome's extension on Ubuntu using this tutorial. 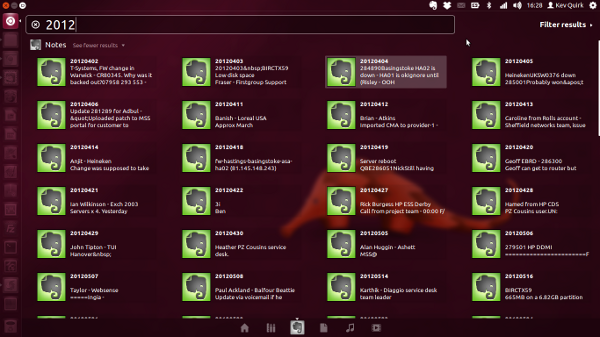 It looks like separate app: can be found in Ubuntu's search and can be locked to sidebar. For now it seems to be working: I've signed into account, synchronized, can see notes, tags and other things, that I can see on my Android tablet. Also I've tried to create note, add tag to it and sync. Found this note on tablet. Nice! I can't say, that functionality of this client is enough for me, because I did not test it for a long time, but it's very good alternative for native linux Evernote not official clients. You can try a combination of Dropbox for folder sync in multiple computers, and Tomboy for note-taking. Setup Dropbox first, then setup Tomboy's folder within Dropbox's folder. Do this in every computer you use. Also, both can be used in multiple platforms. Tomboy and UbuntuOne has worked well for me. There is also emacs-evernote-mode, that let's you edit and create notes in Emacs using either XHTML or TEXT mode. The cool part is that you can post a region from any Buffer as a note with a single command M-x evernote-post-region. I realize this is probably appealing only for Emacs users (such as myself). Not the answer you're looking for? Browse other questions tagged software-recommendation evernote or ask your own question. Is there an alternative to XWord for doing NY Times crosswords? Is there some application to download files from popular file hosting websites? Good application for taking notes on 12.04?